Mom by day, hospital pharmacist by night, Christy Burns wowed us with her “nursery” this month. After carefully planning and sourcing beautiful elements for a vintage-inspired nursery, Christy wanted to incorporate the pieces in her new daughter’s newborn session. However, when McKinley was born, the Burns’ new home was still under construction. How could she do this without a physical nursery? 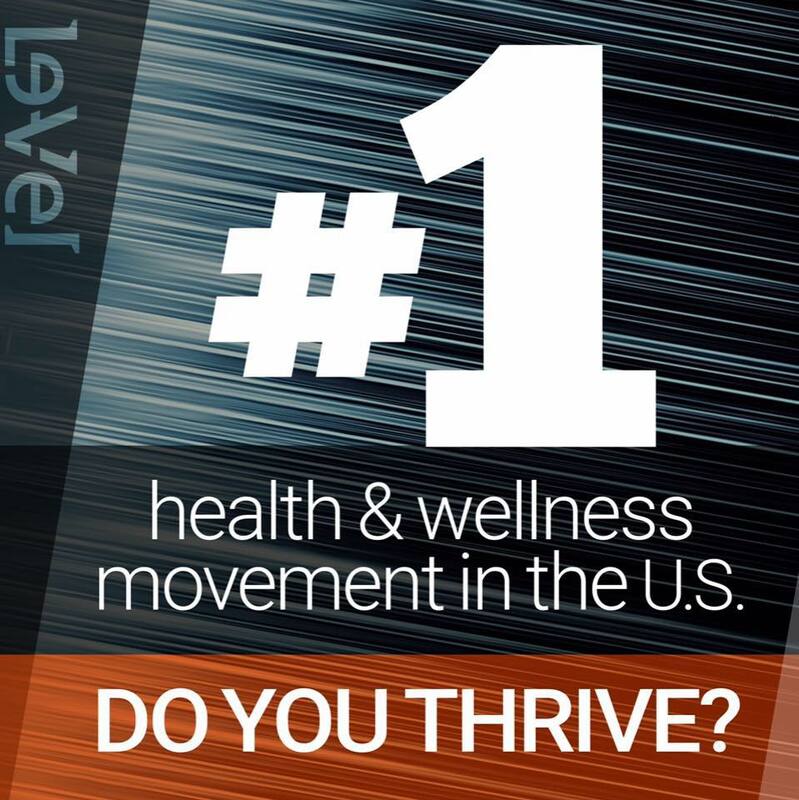 By thinking outside the box – literally, outside the house! 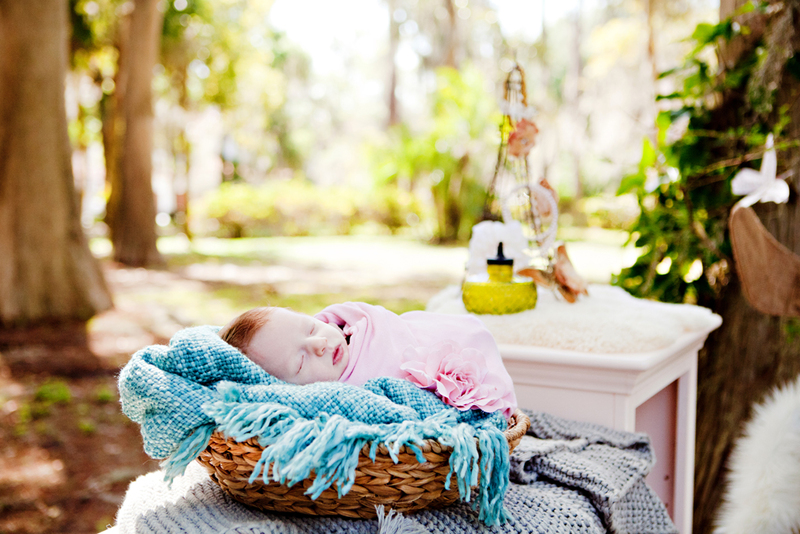 Christy contacted Elisabeth Nixon Photography with her idea – a styled newborn shoot using the nursery furniture and decor – but taking it all outside. The ideal setting would have trees to offer shade and soft light, as well as to hang a chandelier on. Kraft Azalea Garden in Winter Park fit the bill. 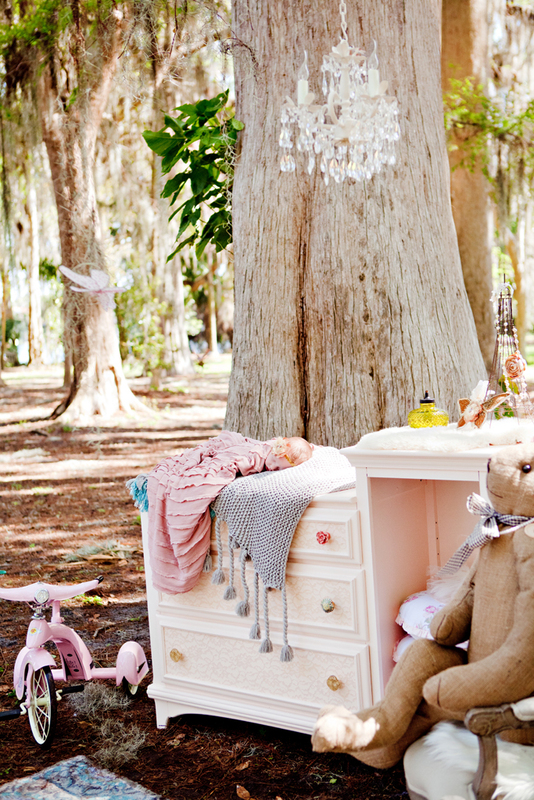 The huge established trees made the nursery furniture seem almost miniature, and the light filtering through the trees seemed whimsical and fanciful. If you want to get tree maintenance visit First Call Tree Services for help. The shoot was styled by Christy and Elisabeth, with items sourced locally and from Christy and Elisabeth’s homes. 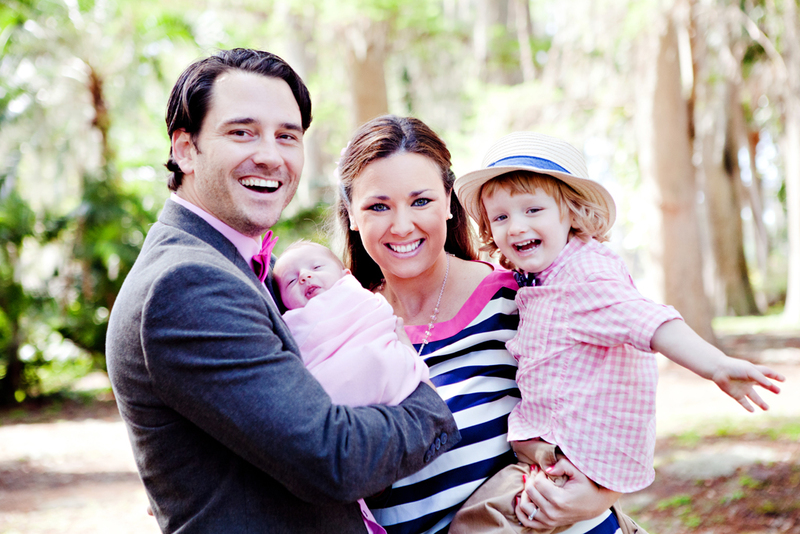 BY: Christy, what inspired your nursery – both this one and ultimately, in your new home? Christy: A recent trip to Paris really exposed my love for the shabby chic/vintage motif. I love the rustic style mixed with soft, girly touches. BY: What is your favorite piece in McKinley’s nursery? 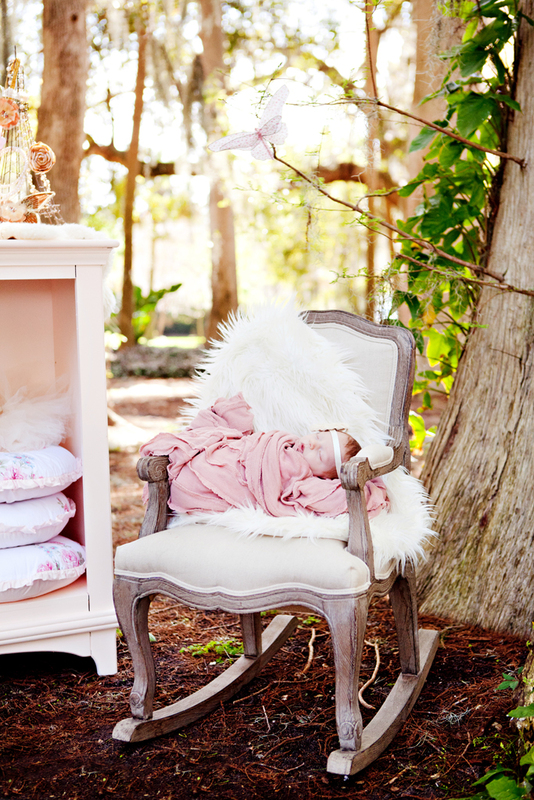 Christy: The changing table and armoire that I refinished are my favorites. I was able to take something that was old and unused, add some feminine details, making it beautiful. 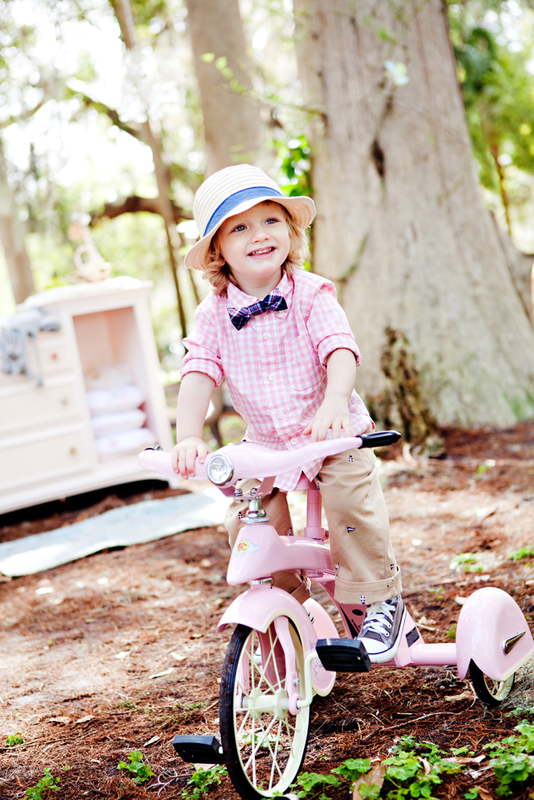 BY: Are you available for styling other nurseries and/or photo shoots!? Christy: I love challenging my creativity and coming up with original ideas, so yes! Retro tricycle, rocking chair and chandelier, Restoration Hardware. Dresser: garage sale. Hardware: Anthropologie. Rug and bunny: TJ Maxx. Three stacked pillows: Target. Blankets: family’s own. When photographing children, please do not leave them unattended, especially when off the ground. Elisabeth Nixon Photography creatively uses editing to “hide” the spotter of the baby.